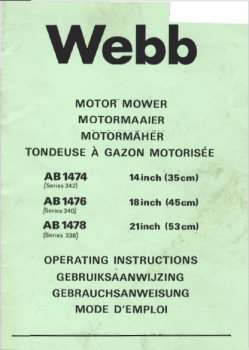 Webb Lawnmower Operating Instructions for AB1474 (14"), AB1476 (18") and AB1478 (21") machines. Here is a digital copy of the operating instructions and parts list for 3 models of Webb Lawnmowers. This machine is circa 1970's-1980's, and does not cover current Webb Machines. This manual may be a high quality copy of an original.